Maybe not so much for the drivers of the RVs and trucks getting blown off the freeway. And yes, this photo was taken here, on the way from Palm Springs to Joshua Tree NP. It is definitely not a still from “Lawrence of Arabia”, as can be easily detected by the absence of any camels. Also there was no music to accompany the descent into the desert. 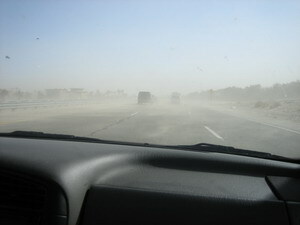 But apart from that – one got a good dose of desert feeling and sand, driven by the storm. Previous PostPrevious Is the Future Streamlined? Next PostNext Good News, Bad News.